With weather threatening the River Cities Speedway, the World of Outlaws Craftsman® Sprint Car Series was forced to go into hurry up mode in an effort to get night one of the Gerdau Recycling Northern Tour at River Cities Speedway in its entirety. After winning the Craftsman Club Dash, Jacob Allen secured the pole position for the Feature. Jumping out to an early lead over second-place David Gravel, Allen was quickly catching lap traffic early in the race.“I tried to go to the top because I saw that I was coming up on some lap cars,” said Jacob Allen. “I figured I needed to go up there and see how it was before I got up on [lap cars]. Unfortunately, it was slick up in Turn 4 and [the car] flew into the barrier. I probably should have stuck on the bottom; but I was able to lead my first Outlaws race.”After getting the track back in racing condition, the field was allotted a couple lap hot lap session. Drivers were turning laps in the nine-second bracket; close to a half-second quicker than lap times that were being turned earlier in the day. 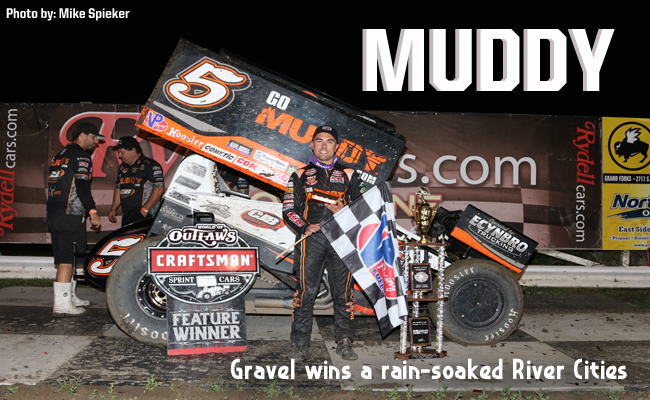 When it was time to go, David Gravel and Kerry Madsen led the field to the restart with four-laps complete.“It’s a bummer it rained,” said David Gravel. “Typically the track is three-grooves top-to-bottom. It was pretty narrow, you just had to try not to make any mistakes.”David Gravel and Kerry Madsen led the field back to the green. As the field was getting up to speed exiting Turn 4, the No. 41 of Jason Johnson slapped the outside wall with his right-rear tire, sending the field scrambling. Multiple cars, including the No. 4 of Paul McMahan and the No. 3 of Tim Kaeding went for a flip. Both drivers were able to get out under their own power, however, their night was done early.For the second attempt the field would line up single file. Gravel was able to get another solid jump on Kerry Madsen and put a five-car length gap between the two. That gap closed on lap nine when Madsen and Gravel banged wheels coming off Turn 2; both where able to keep going.“I drifted up and let Kerry [Madsen] get by me, but we were lucky enough to get right back by him.”Madsen pounced on lap 19 to get by Gravel on the backstretch, however, Gravel was able to work his way back by the No. 2M.“We had the car to beat,” said Kerry Madsen. “We got the lead there once, just couldn’t hang onto it good enough, it’s a great result for the team.”With five laps to go, the field was slowed when Clyde Knipp in the No. 13 slowed on the backstretch.Again with a single-file restart, Gravel was able to rocket out to a commanding lead and didn’t look back en route to his ninth win of the 2017 World of Outlaws Craftsman Sprint Car Series season. The Series returns to action on Saturday, June 17 at Red River Valley Speedway in West Fargo, N.D. Fans can purchase tickets by visit the ticket gate or by visiting slspromotions.ticketforce.com.